Brother Vavek (University of Nebraska-Lincoln, ‘19) (left) and Brother Evan Helman (University of Nebraska-Lincoln) at IMPACT18 in Orlando, FL. Most fraternities will talk up their brotherhood’s social, academic and leadership achievements until your ears fall off. Those are incredibly important, don’t get me wrong. But what distinguishes our fraternity from all the others? I rushed Phi Kappa Theta because it offered something that I didn’t see in any of the other fraternities on campus—the Spiritual Pillar. This past January I had the privilege to travel to Indianapolis alongside 40 other brothers of the Nebraska Pi Chapter to attend SEEK2019. SEEK is a biannual conference put on by FOCUS, the Fellowship of Catholic University Students, a national collegiate outreach program. 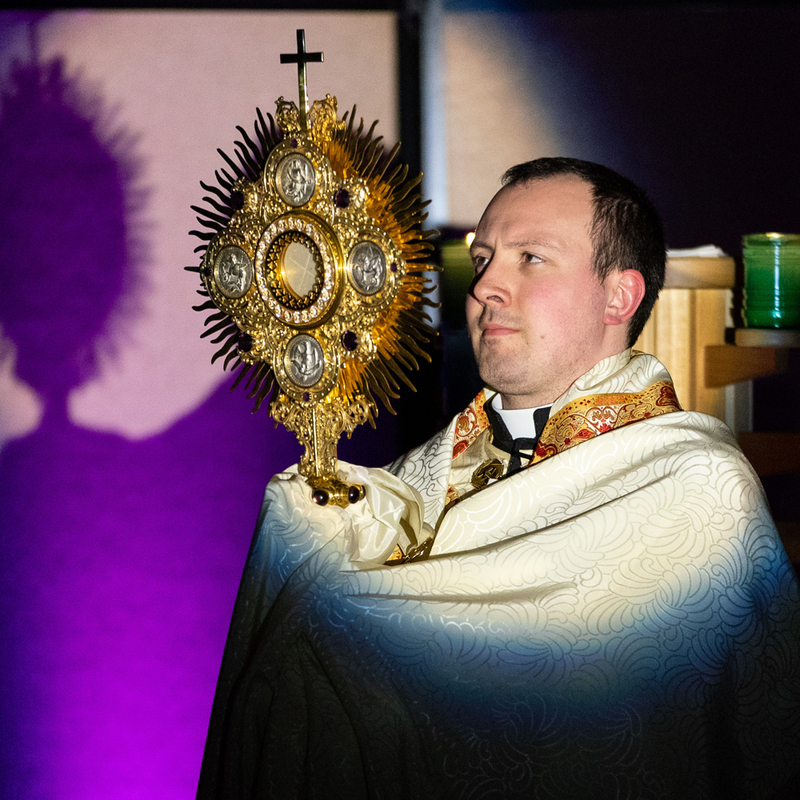 Over 17,000 students who attended the conference were able to hear inspiring talks from top Catholic speakers, attend Mass daily, take part in adoration and confession and hear a concert from Matt Maher and NEEDTOBREATHE. We were also able to connect with fellow brothers from four other Phi Kap chapters. Some of these opportunities were made possible by FOCUS Greek—the FOCUS outreach tailored to students in fraternity and sorority life. That weekend, it seemed like the pieces just fell into place like a puzzle. First of all, we were fortunate that the conference was held in Indianapolis this year, not far from the National Office. Employees of the National Office as well as our National President, Adrian Gonzalez (University of Texas at Austin, ’78), were present at a the Phi Kap vendor booth throughout the entire conference. 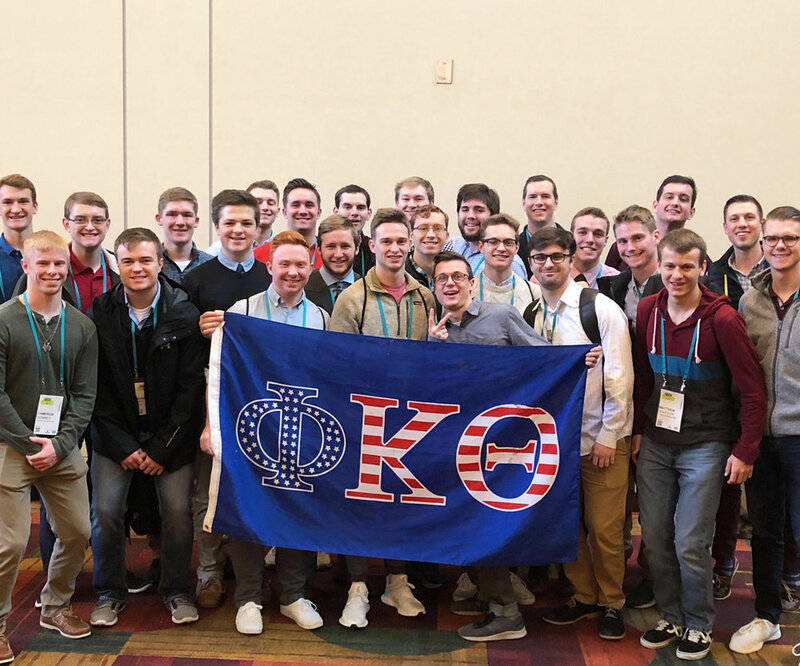 The fraternity served as a sponsor for the conference, obtaining a booth to gain leads for students and chaplains interested in starting a Phi Kappa Theta colony on their campus. This also allowed Phi Kaps attending SEEK to connect with staff from the National Office and network with other brothers that stopped by the booth. Some brothers even took a break from the conference to visit the National Office in Indianapolis, only 20 minutes away from the convention center. Members of Nebraska Pi at SEEK 2019. But it didn’t stop there; the pieces of the puzzle kept falling into place. It also happened that the weekend of SEEK was the same weekend that Dr. Michael Brown and his DMB Coaching team would be in Indianapolis training alumni volunteers on the new spiritual development curriculum. This resource guide, Beyond Belief, will soon be launched to chapters all over the country to assist in strengthening brothers spiritually and embracing the pillar that makes us unique. This perfect timing allowed the DMB Coaching team to hold a special session for the brothers attending SEEK: a sneak preview of the Beyond Belief material. I was taken aback when I got my hands on a hard copy of the resource guide because of how thick the booklet was! Dr. Brown then gave us an introduction to some of the resources and activities inside. The wealth of information in those pages couldn’t even be covered in the three hours we had together. After getting a sneak peak of Beyond Belief, I am convinced that it will be incredibly beneficial to all the chapters that give it a chance. It is inspiring to see the our Fraternity making an investment into the spiritual formation of its members. As a brother, I am proud to be part of an organization that embraces and values spiritual development. The new Beyond Belief spiritual curriculum is a great example of Phi Kappa Theta’s commitment to developing well-rounded, passionately driven men. Development in all five of our pillars is crucial. As Phi Kappa Theta Fraternity continues to be dedicated to a pillar that many other fraternities neglect, we will begin to truly distinguish ourselves as the premier organization for developing servant leaders. Furthermore, we will begin to live every day more in line with our mission: Phi Kappa Theta actively develops men to be effective leaders who passionately serve society, Fraternity, and God. Jeb Vavak is a senior Management major at the University of Nebraska-Lincoln. He is from Ashland, Nebraska and graduated in 2015 from Ashland-Greenwood High School. He has served the Nebraska Pi Chapter as President, Philanthropy Chairman and Recruitment Assistant. On campus, he is active at the Newman Center, is a member of Omicron Delta Kappa Honor Society and served as an Orientation Leader for UNL New Student Enrollment. In his free time he enjoys playing basketball and listening to music. Main Image: Brothers from all chapters at FOCUS Greek Bid Day event.